Have you ever played the telephone game? One person starts. They whisper something into the ear of the person next to them. That person then whispers what they heard into the ear of the person next to them... and so on. At the end of the line of people, the person says what they heard out loud and it's compared, usually with lots of laughter, to what was originally said. It is never actually what was originally said and is usually something quite silly compared to what was originally said. Geanology websites, unfortunately, often play out like the telephone game. The same information is parroted over and over from family tree to family tree, becoming slightly skewed here or there, which is then skewed again later and before you know it, you have this individual on a family tree that has a different name or a different birth or death date which can wreck havoc on entire ancestry lines. I've run across situations in researching my own family tree, where I noticed that an entire line of someone's tree was incorrect because they fudged someone's name. Further adding to this frustration, so often in my research, I've run across a blurb of interest from a book or family tree - but it wasn't properly sourced. So, for all I know, it could have been plagiarized directly from another author or could be an inaccurate paraphrase. Often times, when I do a keyword search, I run across 20 pages that all have the exact text verbatim - so, in my experience, plagiarism is rampant, even in genealogy. As I begin to put together stories of my ancestors here, the importance of proper sourcing or creating a proper bibliography for information is drawn into the spotlight for me. I would like for the information I post to be verifiable by you - so that you know that what I'm telling you is the truth. And also potentially disputable by someone more knowledgeable than me... so that I can correct and sure up my information. To that end, when I post family information here, I will use footnotes to give bibliography information. It's easy to fall into the trap of thinking that your research is only for you, you will know where you got the information - or it will never be important for anyone else to know because it will never leave you. But it's too easy for your family tree research to wind up on a public family tree by someone else's hand. And really, are you going to remember where you learned the origin of Johnny Sue's name in 20 years, when you've traipsed through two centuries of research? 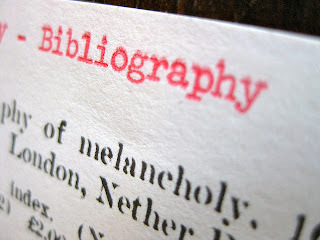 Creating a bibliography can be super easy. I use Legacy Family Tree software which automatically creates the bibliography for me if I plug in the information about my source. Anytime I create one of the myriad of reports from it, it adds footnotes for each bit of information in the report and lists the bibliography at the end of each one. That makes it super easy to print out reports for other people that are properly sourced. 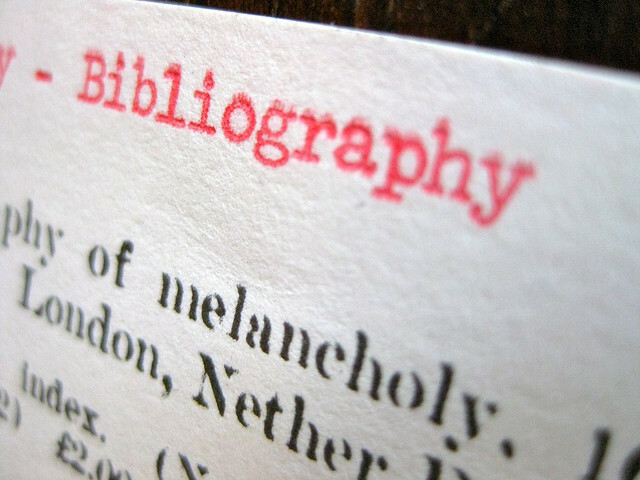 You can also create the bibliography entries on your own manually or by using a resource like EasyBib, which is a bibliography creation service. There is an ideal format for each type of source... books have their own format, magazines have another. However, I find it much more important than formatting, to at least have the proper information there. In that way, I guess I'm an armchair researcher. The name of the source you used. The title, collection name, website name, article title. The author of the source. The date you accessed the source. Especially in this day and age when updating online information is as easy as clicking a few buttons, data changes rapidly. Information could change before or after you access it so keeping track of when you accessed it will help later researchers determine why what they see is different than what you saw.